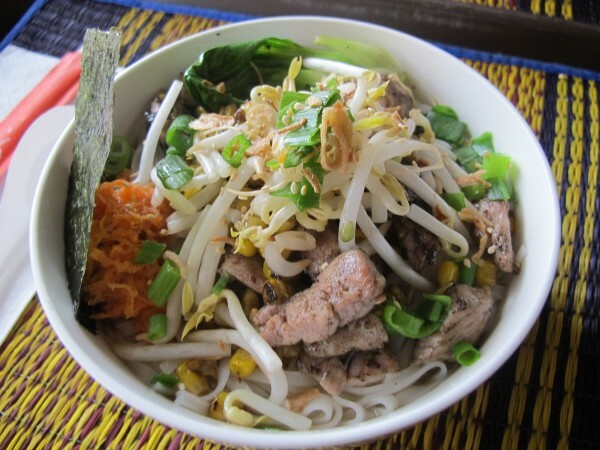 A chicken, bok choy and roasted corn noodle bowl, made with rice noodles and chicken and pork broth. 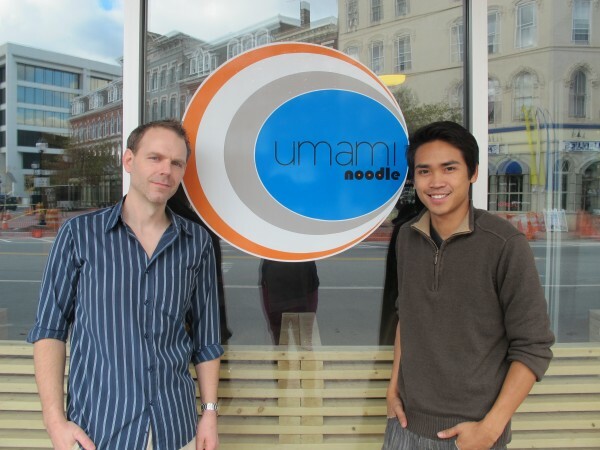 Jeremy Abbott (left) and Jira Rustana recently opened Umami Noodle Bar in downtown Bangor. The made-to-order noodle bar with ingredients list at Umami Noodle Bar. A noodle bowl made with chicken, napa cabbage, bean sprouts and soba noodles, served with a spicy Thai tom yum broth. When business partners Jira Rustana and Jeremy Abbott decided they wanted to open a restaurant in downtown Bangor, they didn’t have specific ideas aside from the following: inexpensive, fast, open late and not like anything else available in town. The resulting concept, developed by the pair over the summer and fall, is Umami Noodle Bar, which now occupies the former location of Thai Siam and fulfills those three requirements. 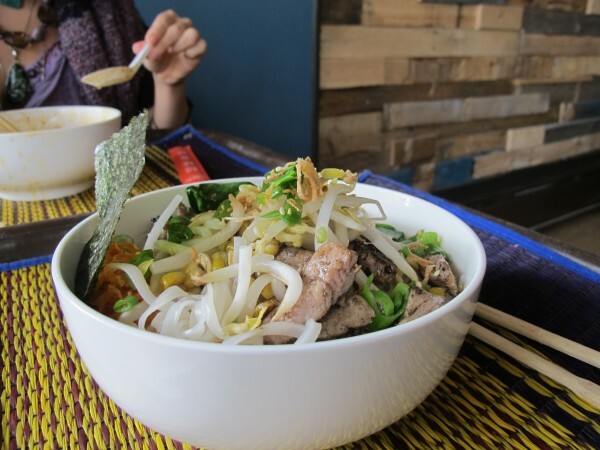 The made-to-order noodle bowls start at $8, the turnaround of the dishes is under 10 minutes, they’re open until 3 a.m. on the weekends, and there’s nothing like it anywhere in the greater Bangor area. Umami — a Japanese word for the “fifth taste,” savory — opened last week and has already experienced a crush of customers. There was a line out the door on a recent cold, rainy Friday filled with people looking for a hot, comforting bowl of hearty soup. Traditional ramen, a wildly popular Japanese noodle soup dish that can now be found in many cities across the country, is available at Umami. It’s nothing like the plastic-wrapped dry packages you buy for a quarter at the grocery store. Fresh, flavorful broth and tender noodles combine with vegetables and protein in a high-flavor bowl. But the point isn’t to make just one type of noodle soup — it’s to let the customer choose just what they want in their bowl. First, the broth. All of the broths are house-made, and customers can choose from beef, chicken and pork, vegetable, miso, or a spicy Thai tom yum broth. Then you pick your noodles, either skinny buckwheat soba, thick wheat udon noodles, egg noodles or rice noodles. Then, pick a protein — everything from flavorful marinated chicken or beef quickly cooked over high heat, to andouille sausage, kielbasa or tofu, to locally sourced slabs of pork belly. All bowls are topped with shredded carrots, fried shallots, nori and scallions, but customers can also choose additional vegetable toppings, like bok choy, kimchi, spinach, roasted corn or shiitake mushrooms. The fast, easy, simple approach to food means that most of the work of the restaurant is done on the front end — the house-made broths take hours to finish, and there’s a whole lot of vegetable chopping and meat slicing to be done. After that, though, it’s a speedy lunch or dinner for downtown workers, shoppers, concert goers and bar hoppers. Rustana, 27, is no stranger to the service industry — his family has operated Thai restaurants in Bangor for more than 15 years, and he himself ran a popular bar at the old Thai Siam, called the Thai One Lounge, for several years. Umami is his first venture that’s his own creation, however — one that he and Abbott opened together. Rustana and Abbott plan to offer a rotating menu of five small plates, each themed by a taste — sweet, sour, salt, bitter and umami — as well as some desserts. A full cocktail menu and beer and wine are also available, in the restaurant and in the small cocktail bar next door. The space itself has been renovated — Abbott and Rustana removed a lot of the clutter and have opened the space up to more sunlight, and have installed reclaimed wood walls and siding and have turned the center of the space into bar-style seating. The bar next door has also been completely renovated. A soundtrack of hip indie rock and electronic music plays softly in the background at all times. 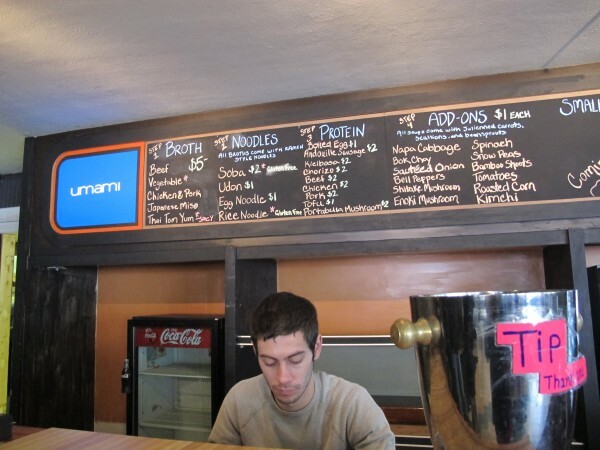 Umami Noodle Bar is located at 1 Main St. in downtown Bangor. Hours are noon to 9 p.m. Monday through Thursday and noon to 3 a.m. Fridays and Saturdays; it is closed on Sundays.